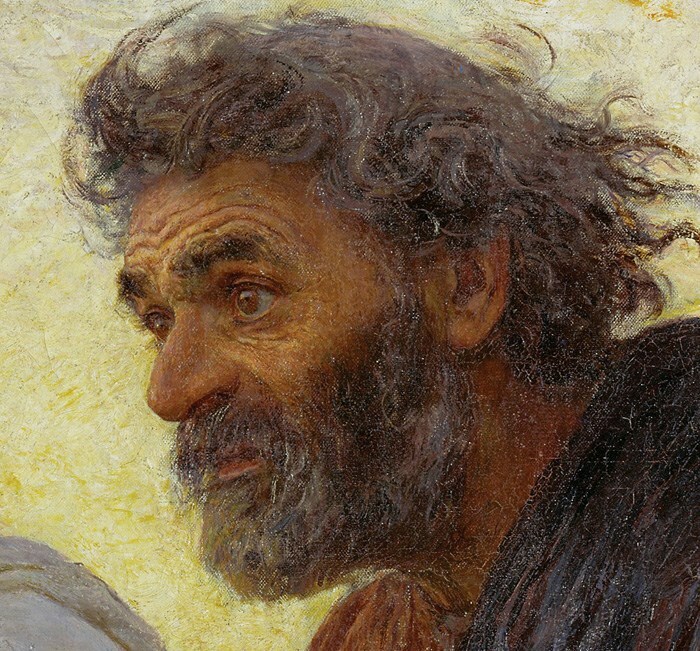 In his painting of Peter and John racing to the tomb (John 20:3-10), Eugene Burnand (1850-1921), captures their determination and urgency. I see in this painting not only these two historical figures, but also the church, even our own fellowship. In the close-up, Peter is wide-eyed and his brow is furrowed. His mind is at work as he hurries along, perhaps thinking about all that has happened and now he has heard this report about an empty tomb. He looks worried to me, but soon that worry will gave way to wonder! The women- Mary Magdalene, Mary the mother of James, and Salome are told by the young man (presumably, an angel) to go, tell His disciples and Peter (Mark 16:1-7). We might even read it …the disciples especially Peter. Just a few days before, Peter had denied that he even knew Jesus (Mark 14:66-72). These are the ones who cannot stay awake and watch with Him in Gethsemene. These are the ones who deserted Him. They let Him down. They were not there when He needed them. They were weak when they should have been strong. They were cowards when they should have been courageous. And Jesus wants them to know that He is risen! And now they are hurrying. It is important for us to be quiet and still before God because His grace contains all the power we need for living (Ps.37:7, 46:10, 2Peter1:2-3), and there are times, too, we are hurrying along. And, figuratively speaking, the Scriptures call us to be in a “hurry.” In Titus 2:14 we are told that Jesus gave Himself for us to redeem us from all wickedness and to purify for Himself a people that are His very own, eager to do what is good! Whether you are rushing to worship or to work or some appointment – I hope wherever you are going – you are inspired by the same news that caused John and Peter to race to the tomb, so that however weak you have been, however much this world has made you a coward, you might experience His strength and courage and know that such character and even more is now ours through faith. And may all your worries – by His grace – give way to wonder! Jesus wants you to know that He is risen! 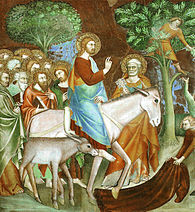 The origin of Palm Sunday in the tradition of the church goes back to 4th century Jerusalem. People would gather at the Mount of Olives in early afternoon on the Sunday before Easter. At about five o’clock the passage of the gospel telling of Jesus’ entry would be read. A processional into the city would begin, and people with palm or olive branches would wave them as they walked. Jesus approached Jerusalem by way of Bethany and Bethphage (Mark 11:1). Bethany was about two miles from Jerusalem. The exact location of Bethphage is not known but it must have been even closer. He sent two disciples there to get a “colt,” a term used in biblical and other ancient literature to describe the colt of a donkey. Matthew’s account tells us that both the colt and the colt’s mother were brought (Matthew 21:7). The action of the crowd is described as completely spontaneous. Lippo Memmi (1291-1356), an Italian painter, is one of the artists whose work adorns the Collegiate Church of San Gimignano in Tuscany, Italy. In his artistic tradition (seen above) the figures are somewhat static. In his presentation of these events, everything sort of seems like it has stopped and everyone looks so still -except the one person who steps in front and is placing his robe on the ground. He makes it just in time! His huge cloak falls into place precisely at the moment when donkey’s hoof will touch it. Here, as in 2Kings 9:13, the laying down of cloaks signifies submission to royalty. Because of what God has done for in Jesus, the Apostle Paul calls upon us to lay down our lives as living sacrifices (Romans 12:1). When God sends forth His Spirit into our hearts that is what we should want to do! People all over the world are coming to know His power, and they want to submit to Him. They are laying down their lives in submission to the King of kings. He is coming! Want to join them? The celebration is about to start. Hurry! You’ll make it just in time. Honesty about our condition is the beginning of blessing. The words of David prayer – For I know my transgressions – remind us that reflection is an indispensable part of a Spirit-filled life. We are a people of joy but, like David, our joy has God’s grace and pardon in Jesus Christ as a backstory. If we accept God’s grace, we are acknowledging our ongoing need of it. As one who sought and experienced God’s grace, David tells us in Psalm 51:17, that a broken and contrite heart, O God, you will not despise. The season of Lent is a time to contemplate the pardoning grace of God and our need of it. The church calendar marks the sacred seasons and times for believers worldwide, reminding us of God’s marvelous redemptive work in our history. It adopts the chronology given in the book of Acts with the coming of the Holy Spirit on the day of Pentecost, fifty days after the Passover feast. Of course, the months and dates associated with all of the seasons and events on the church calendar, like December 25th for the birth of Jesus, are not the actual dates in history, but we know they did happen! The dates are commemorative. As evangelicals, I believe there is great value in recovering aspects of our larger Christian tradition as a means to reflection and critique in order to help us refocus on genuine Christian spirituality in our increasingly secularized culture. Renew a right spirit in us, O God! Resurrection – the Debt is Paid! Mary was searching for the Lord’s body and was prepared to carry it away, but all she carried away that day was the good news. That is what the church of Jesus Christ has for you, too, just the good news, no burden, only gratitude for grace. Come and join us as we praise the name of the One who has made us free. The human heart is beyond a “cure” according to the Bible, it must be changed. When it comes to the spiritual condition of the human heart, the prophet Jeremiah is not optimistic (c.f. 13:23, 30:12). The recent military trial of Army General Jeffrey Sinclair has once again exposed in public the incurable heart of humanity through the adulterous behavior and abuse of power carried out by this highly regarded military figure. In his defense, 24 of Sinclair’s colleagues and soldiers who had served with him or were under his command, came to testify about his good character. I was especially struck by one of Sinclair’s character witnesses. He alluded to the story of David’s adultery with Bathsheba and the murderous cover-up that takes the life of her husband, Uriah. (2Samuel 11). He then went on to compare Sinclair to David, “I believe that General Sinclair is a man after God’s own heart. I believe he can be rehabilitated.” His opinion of his friend is that he is a kind of David, who is described in the Bible as a man after God’s own heart (Acts 13:22, 1Samuel 13:14). I’m glad this soldier has friends but do not think it is really helpful or accurate to describe the disgraced general this way. This is the Bible’s comment on David in his youth and long before he commits his crimes, not in their aftermath! He was not always after God’s own heart, and the Lord’s message to David after he does these horrible things is very different: Now therefore the sword will never depart from your house, because you despised me and took the wife of Uriah, the Hittite, to be your own (2Samuel 12:10). Like all of us, David would need God’s generous grace to live with the consequences of his actions. stressed out by sin, weary of wickedness, and burdened by the bad, only Christ our Savior and Lord, can be the Cure.